LET's WELCOME SPRING! 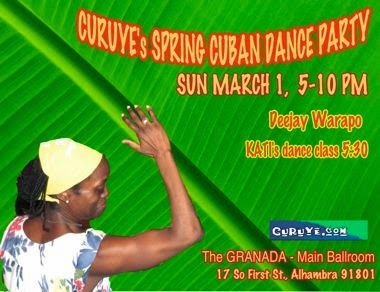 IT'S ALREADY TIME FOR CURUYE'S MARCH CUBAN SALSA TIMBA DANCE PARTY! THE PARTY IS THIS SUNDAY! The GRANADA has told Curuye that the MAIN BALLROOM will be available for the March party too! SO LET'S FILL IT AGAIN! KATI HERNÁNDEZ will kick off the party with some AFRO TIMBA to spice up your dancing along with her PA' LA ORILLA DANCE TEAM. Then DEEJAY WARAPO will spin the dance music they're grooving to from LA HABANA to SANTIAGO de CUBA! CUBAN SALSA! TIMBA! SON! REGGAETÓN! y RUMBA! BIRTHDAY FESTEJADOS this month so far include LUDIS BENÍTEZ, ANA TELLEZ, DAX MAFESI, RAÚL LUCKY… (if you have a March birthday message Curuye by February 27). They'll be dancing the BIRTHDAY DANCE, and sharing some birthday cake with you. There are some tasty dishes on the varied menu at The Granada that you may like to sample. SHARE THIS POST & INVITE YOUR FRIENDS! LET's MAKE IT BIGGER THAN LAST MONTH's BIG BASH! $10 cover includes Kati's dance class! FREE 4-HR PARKING in STRUCTURE ACROSS FROM THE GRANADA! CUBA LIBRE, SAT. FEB 21st!!! 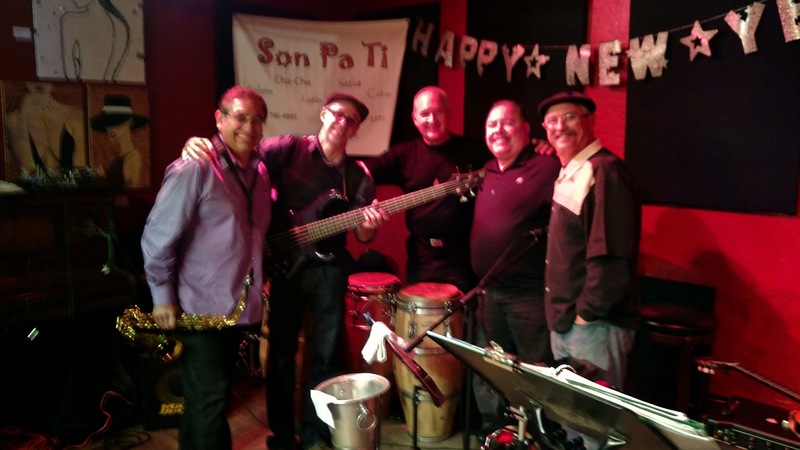 WHAT: Come experience a night of Cuban Rhythms w/Drumming & Dance! Featuring authentic sounds of Mambo, Cha-Cha-Chá, Son (which gave birth to Salsa), Rumba and Roots Afro-Cuban. There will be informal line-dancing and some fun guided dances for anyone who wants to participate. Tasty Cuban treats, including yucca & plantains and traditional Mojitos at the bar. In Cuba, we call this type of party a "peña." Juan Carlos Blanco is a Master Drummer & Dancer from Habana, Cuba with over 30 yrs. of professional & authentic experience. This is a great opportunity for the community to experience a real Cuban Peña without leaving San Diego! Please send this around and help to fund Silfredo La O's movie and art project. He has been teaching out here in San Diego for over 10 years sharing his talent so we can learn AfroCuban dance, drumming and appreciate the combination of music, dance and art through his paintings. He has opened his home for rumba parties. Let's give back to our maestro, Silfredo. Here is the AIM Hatchfund link to help fund his movie project. Tonight! 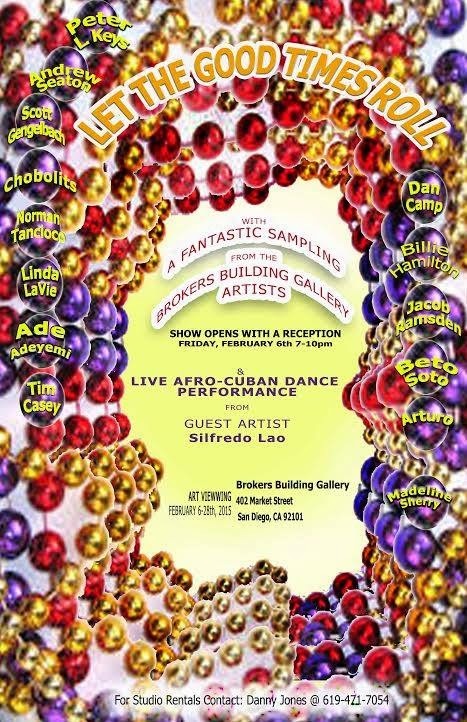 February 6th from 7:00pm to 10:00pm is the opening of a group art exhibition at 402 Market St SD 92101. Silfredo La O Vigo will present four paintings and a dance performance. 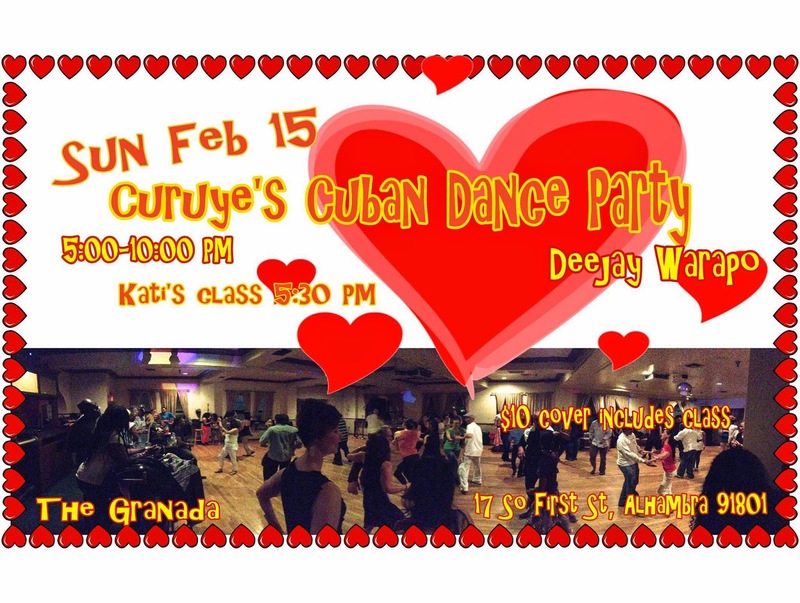 In L.A.: CURUYE's FEBRUARY CUBAN SALSA TIMBA DANCE PARTY CELEBRATING LOVE & FRIENDSHIP! CELEBRATE LOVE & FRIENDSHIP (+ A LOT OF FEBRUARY BIRTHDAYS!) at CURUYE's SALSA TIMBA DANCE PARTY! 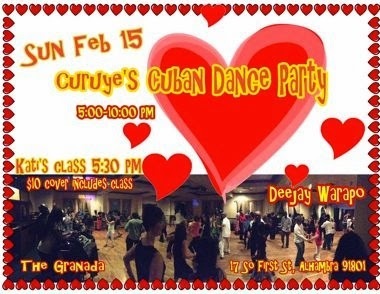 BRiNG YOUR FRIENDS & LOVED ONES for a GREAT NIGHT of DANCING CUBAN SALSA, SON, REGGAETÓN & RUMBA with Deejay WARAPO spinning the latest DANCE MUSIC from CUBA! YOU MIGHT WANT TO WEAR RED or PINK FOR THIS PARTY! And we'll be partying in the GRANADA's MAIN BALLROOM downstairs this month! Birthday lady KATI HERNÁNDEZ and DAVID LENEMAN will warm you up with a CASINO (CUBAN SALSA), & RUEDA de CASINO class at 5: 30 PM! THEN LET's KEEP EXPRESSING OURSELVES ON THE DANCE FLOOR THE REST OF THE NIGHT ! The GRANADA's chef has a varied menu of tasty food for hungry dancers. Since it's around Valentine's (the day after) you might like to treat a special someone to dinner that night!, or have dinner with your friends that evening! HELP SPREAD THE WORD! CAN'T WAIT TO DANCE with ALL YOU FUN & FRIENDLY CURUYE PEEPS! $10 cover includes Kati & David's dance class! 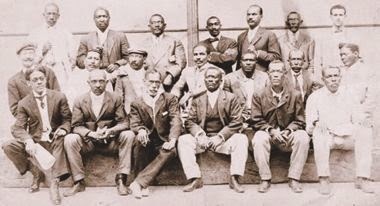 SUN, FEB 8, 12:30 PM; TUES FEB 16, 8:40 PM; MON FEB 16 @ 8:05 PM : 1912 BREAKING THE SILENCE, ROLANDO's 2010 documentary relating the suppressed history of Cuba’s Partido Independiente de Color (PIC) founded in 1908 by Afro Cuban veterans of the War for Independence against Spain, but whose fight for racial, political, economic independence was ended in 1912 by a massacre of thousands of Afro Cubans affiliated with PIC by the new independent Cuban government of the time. BE SURE TO CONFIRM SCREENINGS. ¡Bailando me enamore!! Come join Rueda in the Park - Santa Ana in beautiful Centennial Regional Park for Rueda de Casino! 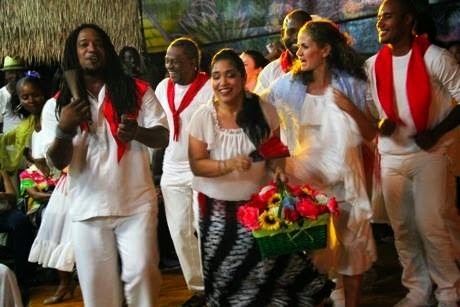 (Salsa Cubana) Enjoy the scenery, the music and the fun as you learn this Cuban social dance. Rueda de Casino is a super-fun upbeat and high energy group Cuban salsa dance (but it can be danced by individual couples as well!) Come learn the fundamental basic elements, lots of variations and the combinations that make up “Rueda de Casino". Our next class will be Saturday, February 14th. Beginner level starts at 11:30am and Intermediate level starts at 12:30pm. Suggested donation of $5/person. Kimba Light will be playing at the Turquoise Bar/Cafe in Pacific Beach on Saturday, February 14th. It appears they have a regular slot beginning February to play the 2nd Saturday of the month. Last time in between their breaks, they let us play some timba from my playlist. So there is more of an incentive to support this event. If you get there before, be sure to buy some food and drinks. It's a great menu and great prices. CELEBRATE LOVE & FRIENDSHIP (+ A LOT OF FEBRUARY BIRTHDAYS!) at CURUYE's SALSA TIMBA DANCE PARTY! BRiNG YOUR FRIENDS & LOVED ONES for a GREAT NIGHT of DANCING CUBAN SALSA, SON, REGGAETÓN & RUMBA with Deejay WARAPO spinning the latest DANCE MUSIC from CUBA! It's Rocio's Birthday (San Diego casinera) so we plan to take her with us. As always, we will meet up at the Oceanside Park & Ride (across from Hunter Steakhouse) at 2pm and leave to LA. 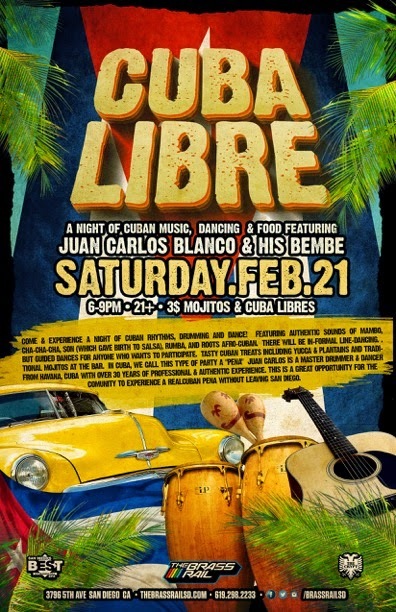 More information about this event is on their Curuye's February Cuban Dance Party Facebook event page. Contact me if you are interested. My contact info is on the Dance Instructors tab of this blog. FEBRURARY is a BIG BIRTHDAY MONTH? Included in those looking forward to dancing the BIRTHDAY DANCE with you: AISHA MAYFIELD DIOOUM, ANA TELLEZ, CHULHEE KIM, DAX MAFESI, KATI HERNÁNDEZ, MARINA RIVAS, PAULA WARD, RAMONA YOUNG … and there may be a few others! (If you want to celebrate your February birthday at this party, message Curuye preferably with a day's notice!). The GRANADA's chef has a varied menu of tasty food for hungry dancers. Since it's around Valentine's (the day after) you might like to treat a special someone to dinner that night!, or have dinner with your friends that evening! ALL AGES WELCOME! COST: $10 cover includes Kati & David's dance class! Thanks for supporting The Granada and Curuye by leaving personal food and beverages at home! 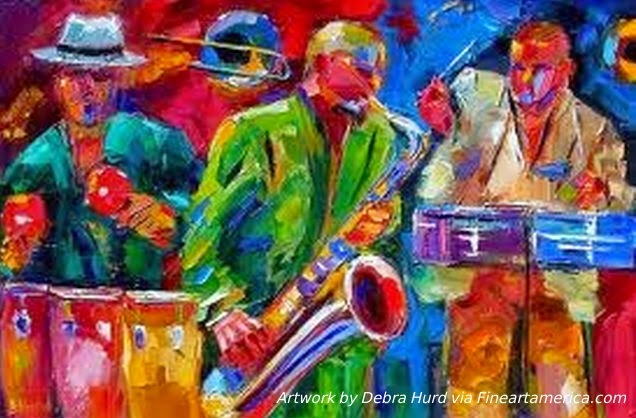 There is a fundraiser for the San Diego Art Museum showcasing Cuban artist's work and the best and there will be a performance by Omo Ache Cuban Cultural Arts. The name of the event is called: Culture & Cocktails Night - Havana Night this Thursday at the San Diego Museum of Art at Balboa Park. Imagine: open-air bazaars, ocean-front walkways, bright colors, crumbling colonial architecture, and salsa music booming through the streets... Enjoy an Old Havana dark rum Signature Cocktail, Cuban sandwiches and delicacies, and a tropical candy station. Roll your own cigar, make your own fedora or fruit headpiece, have your picture taken in a touch-graffiti photo booth, and dance the night away to Latin music spun by DJ Mike Zee. Come dressed in ruffles, fedoras, and your island-best during this C&C Havana nights-themed party inspired by The Welcome Galleries' Cuban Contemporary Art installation. Stay late, and head over to Panama 66 for a performance by Besos de Coco from 8:00-11:00 p.m.
Culture & Cocktails is free for Museum members. Membership starts at $45, which is less than the cost of admission to three C&C events. Not a member? Join today. Students will learn to play and/or dance Merengue Haitiano in a fun ensemble setting. Drums available. Come learn the roots of Merengue in this fun series! Our dancing peeps from San Diego and Tijuana are grouping together this year to perform at the San Francisco Rueda Festival. Their team name is Rumbabalu. They are having a casino/rueda social in San Diego (nearest Little Italy). They will perform their number for the crowd and then there is dancing afterwards. Let's cheer them on and enjoy the company of our extended dancing family!! Weeaaaa! The last time we all got together with a Cuban dance force was two Saturdays ago and it was fierce!! Son Pa Ti loves us and want us to come back to dance. They let us play our timba music in between sets as well. We had such a big crowd that it was by far the best time we had in a long time. LET'S DO THAT AGAIN! COST: Just some food and drinks. ALWAYS FREE PARKING at La Jolla Car Wash next door or Ace Hardware (after they close). This coming Saturday is February's installment of Casino on Concrete. 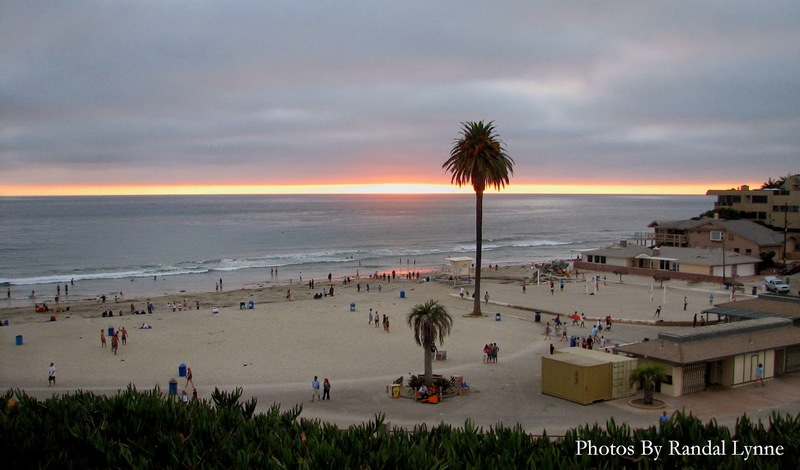 We are dancing at Moonlight State Beach in Encinitas. Get ready to shake what your mama gave you and join in on some fun ruedas, salsa suelta and just plain one-on-one Cuban salsa. Let the dance madness begin! !